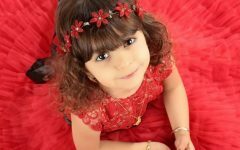 For this young princess’s gorgeous hairstyle the stylist has used the pull through braid technique to create that classic Elsa braid fullness. To complete the romantic feel there are lots of flyaway strands from her fluffy textured locks and a small tiara and delicate white flowers were also added. While Elsa hairstyle featured the French method style of braiding you can also use the Dutch method. As we see here the model’s hair was braided from just above the crown in a tight Dutch plait before the stylist switched to the regular three-stand technique to complete the look. The model’s hair is thick, which allows the tight braid to look full and gorgeous. 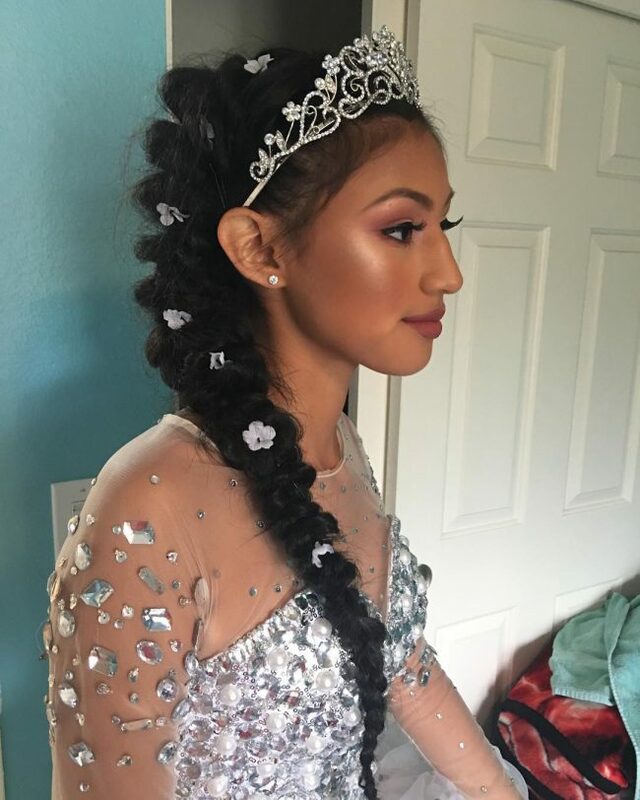 In this look, a mixture of the pull through braid technique and the French braid method were used to create a unique Elsa-inspired look suitable for a special occasion. We can see the French braiding around the crown and the pull through at the bottom. She’s wearing it on the shoulder just like the Frozen character. When creating your own Elsa look remember to loosen the braid once you’re are finished to give it that same full look and don’t worry if a few strands come loose. 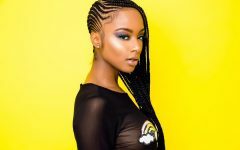 You can wear the plait down your back like this model; especially if you have eye-catching color combinations like her ash black and caramel. In this look, the models' thick icy blonde locks were combed out and teased over the crown before being firmly French braided. At the nape of the neck, the style was switched to a normal plait which hangs down her back. Teasing the hair in front is an important step and if your hair is not as thick as you would like, hair extensions are a simple solution. 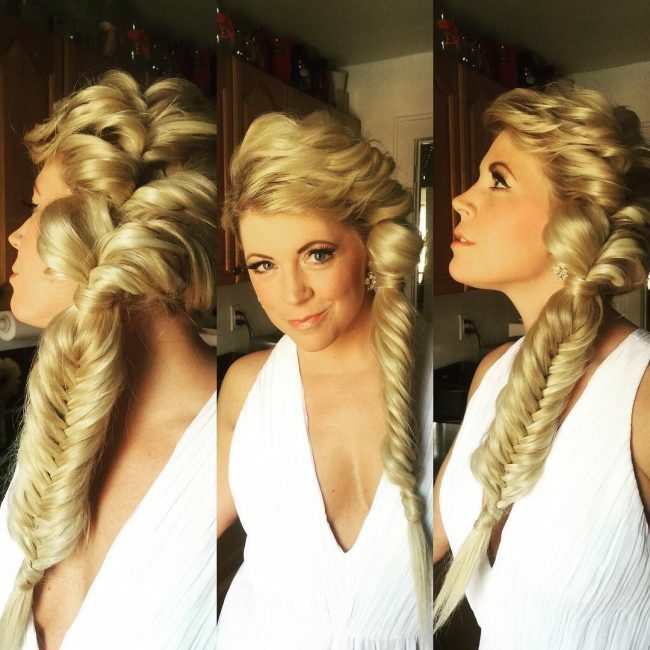 Here we have an excellent replication of Elsa’s look; the style is thick and full through the top section where it has been fashioned into a pull through braid and at the bottom a tight fishtail was made to allow it end thinly. Always remember that you can loosen the plait, but not make it tighter so start firmly and loosen once the entire plait is complete. This model’s enviable blonde hair makes her look just like Elsa! In front, you can see how the hair was teased to give it that trademark lift and once more a combination of the pull through and fishtail techniques were used. The fishtail method is a great way to end an Elsa-look braid as it brings the strands together quite firmly. Once you have mastered the regular braiding methods you could try something more complex like the one shown here or even create your own! 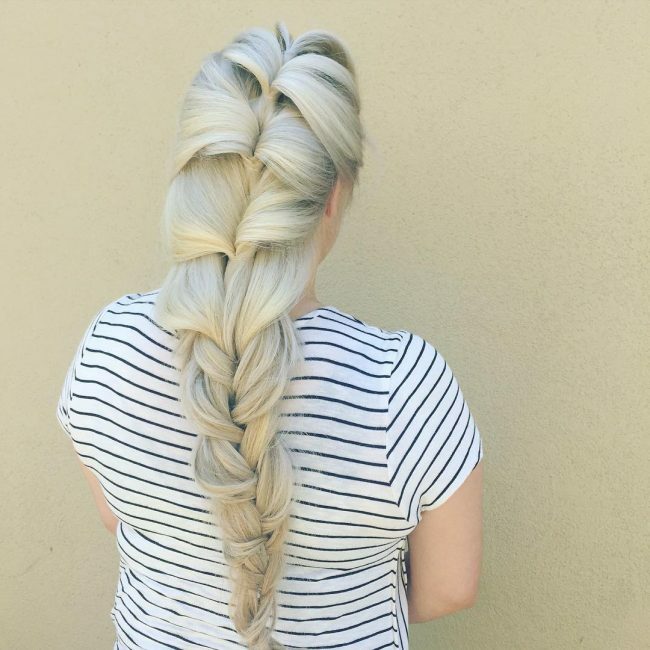 What matters is the fullness this method has created and how the stylist has tapered the braid off using the simple three strand technique. To make a neat look like this last make sure you use plenty of hairspray. Notice how this plait has been fashioned at an angle across the back of the model’s head? This is so that it can sit smoothly over the shoulder. 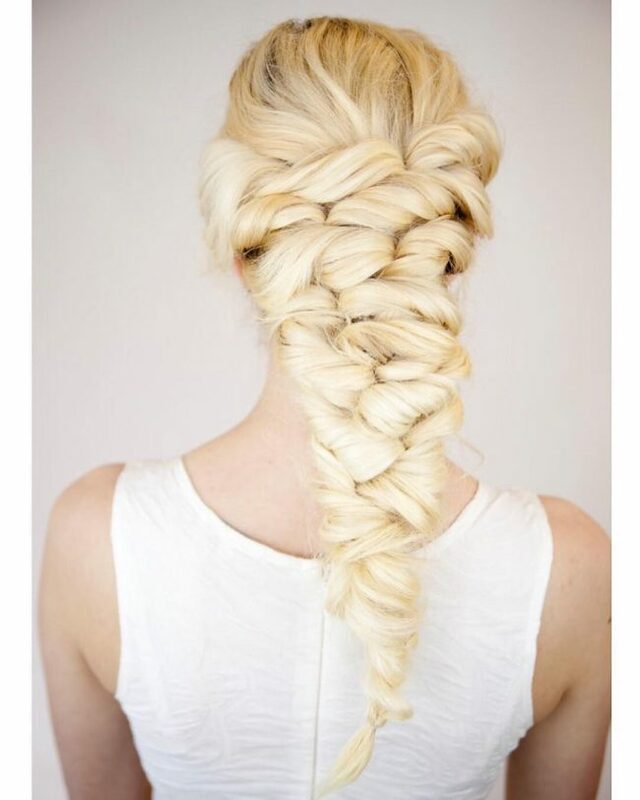 This hairstyle begins with the French method and the stylist used fishtail braiding to finish off. 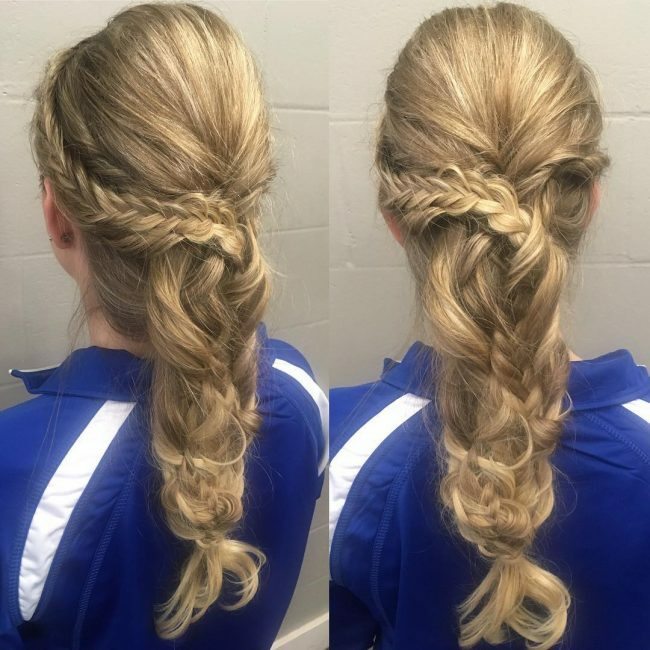 The pull through braiding technique is so simple to master (and even do on your own hair) and very effective in creating a full thick base for your Elsa-inspired look. This models' hair seems to have a wavy texture which also helps bulk it up. 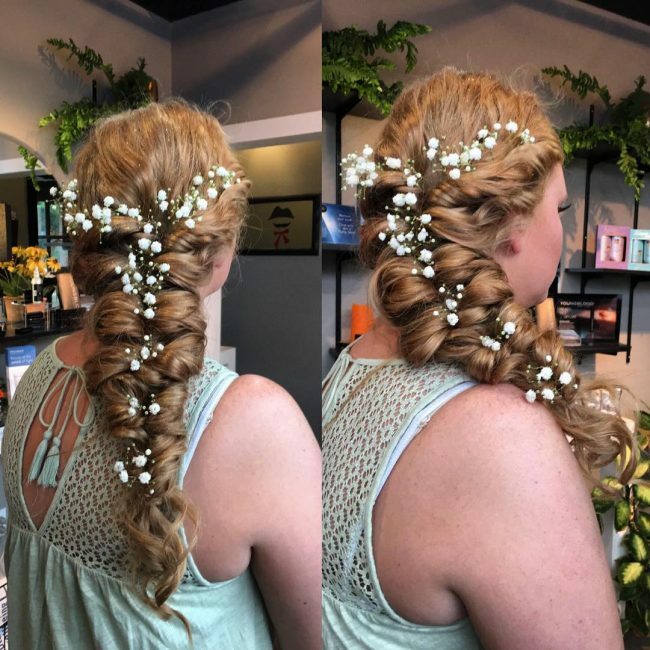 Only one braiding method was used throughout and the style has been finished off with pretty white blossoms as accessories. 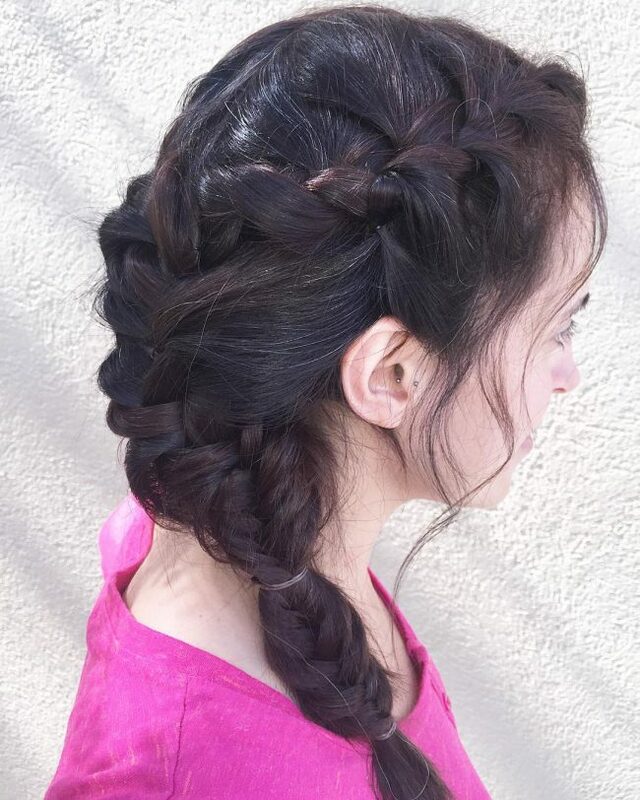 In this hairstyle, the stylist has used a five-strand technique to create an intricate looking plait on top which continues right until the end. She is wearing her plait down her back and her pale shade of blonde hair helps add to that Frozen feel. This method is a little tricky to master but the results are worth the effort. 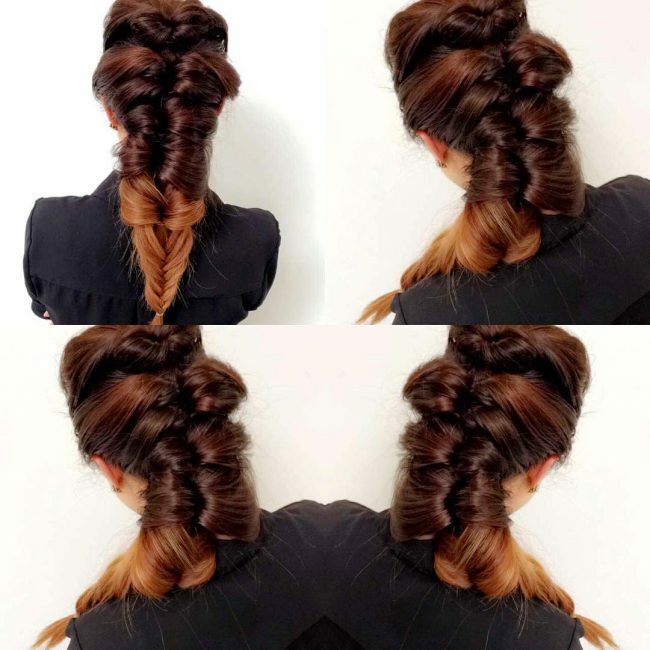 For this stunning look, the stylist has teased the roots and the hair around the crown allowing for a messy and full look on top while the plait itself has been twisted onto the shoulder and braided in the three strand method. This look is quite loose, but it being held in place by hairspray. 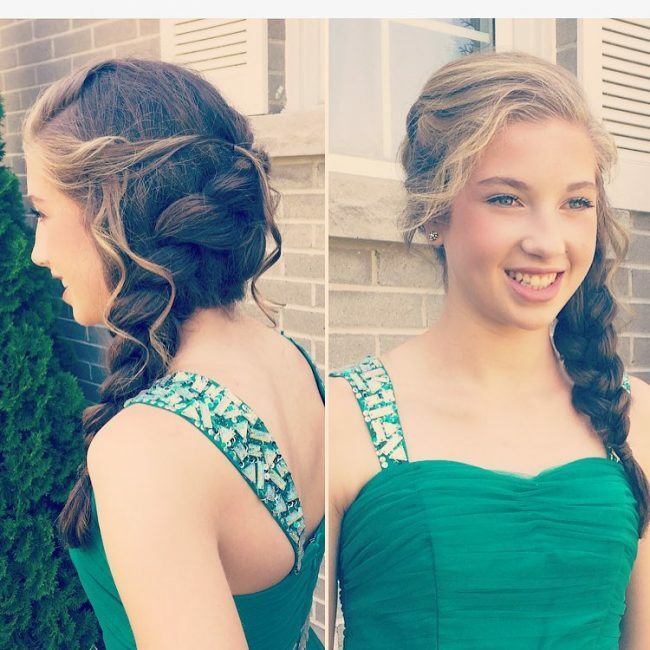 This model has thick, slightly wavy locks – perfect for creating an Elsa braid! 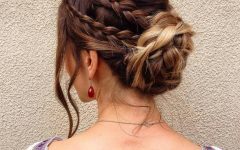 Her creamy brown hair has been gathered up into a French braid on top, then into a short plait before ending in a ponytail. 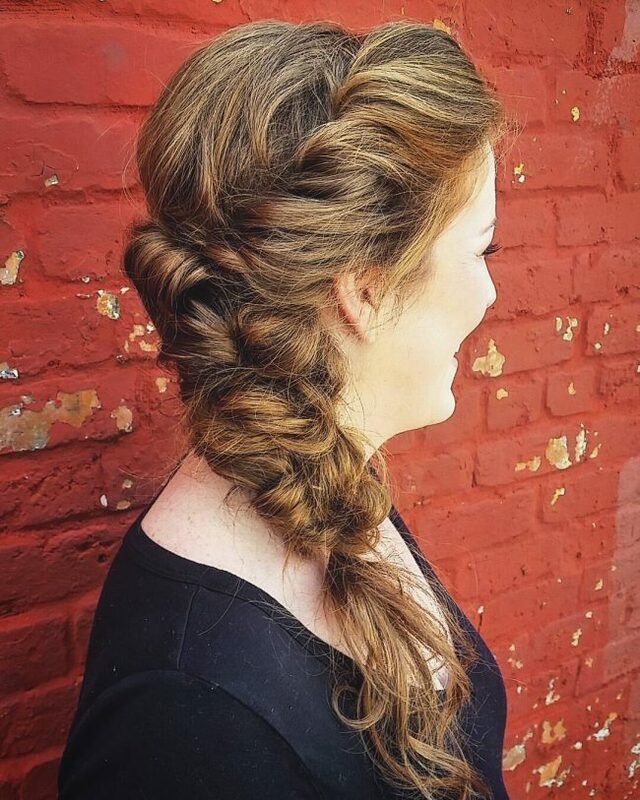 The stylist has fashioned the braid toward the side and allowed flyaways to soften the look. 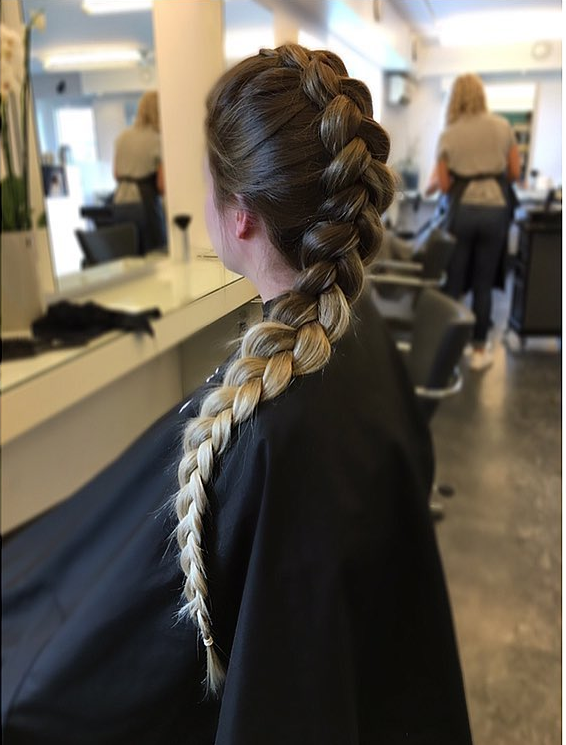 In this style, the Dutch braiding method was used to create an Elsa-inspired look. This method works well because it creates natural lift, which is an essential component of this hairstyle. The braiding is quite firm but has been loosened toward the end and she’s wearing it with a long brushed over fringe. 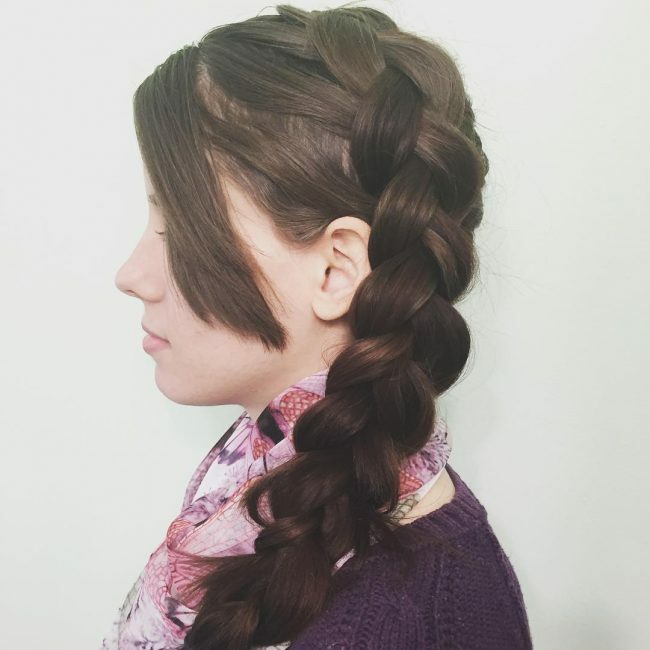 For this singular look, it would seem that a variety of braiding techniques have been used to create a pretty and unique hairstyle. 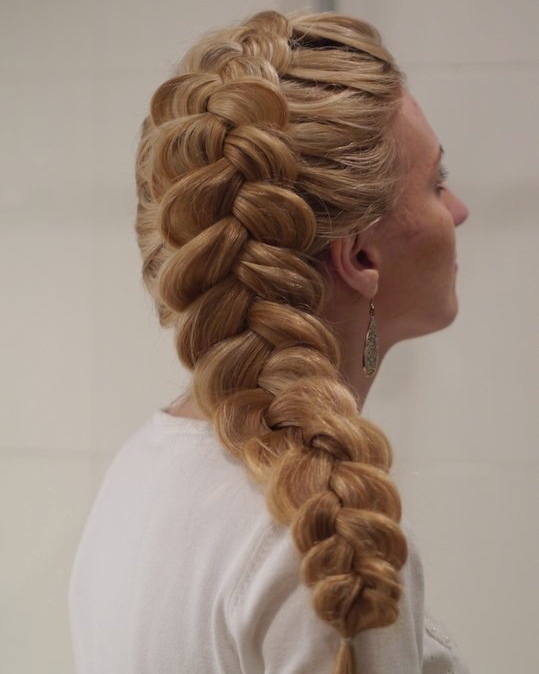 From the top, it appears as though a number of three strand braids have been used to create one large braid that continues past the neckline to become a fishtail braid on the end. For special occasions, plaits are a good choice – not only are they beautiful to look at but they are also hardy and easy to decorate. In this young models' hair, the stylist has created an intricate and romantic one of a kind braid that falls thickly down her back. Even more volume was created by allowing for plenty of flyaway strands. This models' hair is full and has a wavy texture which the stylist has used to create a pretty Frozen-inspired hairstyle. 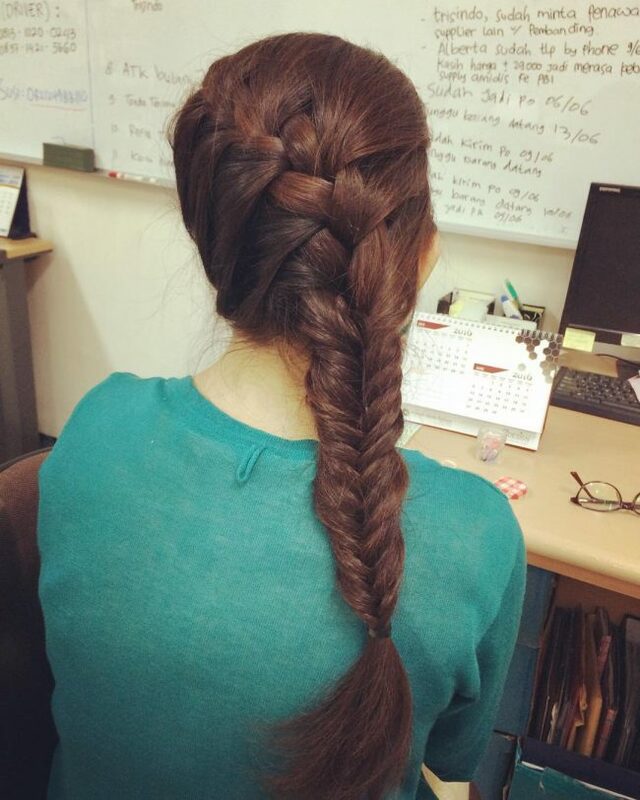 From the side, we can see how a fishtail plait has been collected with other sections of hair and weaved into a thick twisted braid that is secured at the end with a hair elastic. 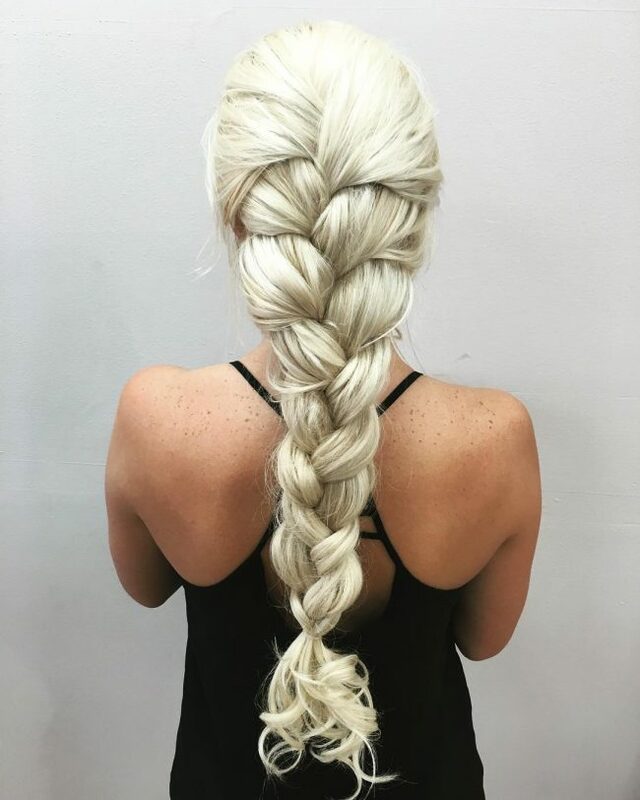 This ice-white hair color is quite trendy at the moment and when combined with long thick locks such as this it is perfect for an Elsa braid. A variation of the pull through braid has been loosely fashioned with her hair and allowed to drape down between her shoulder blades. 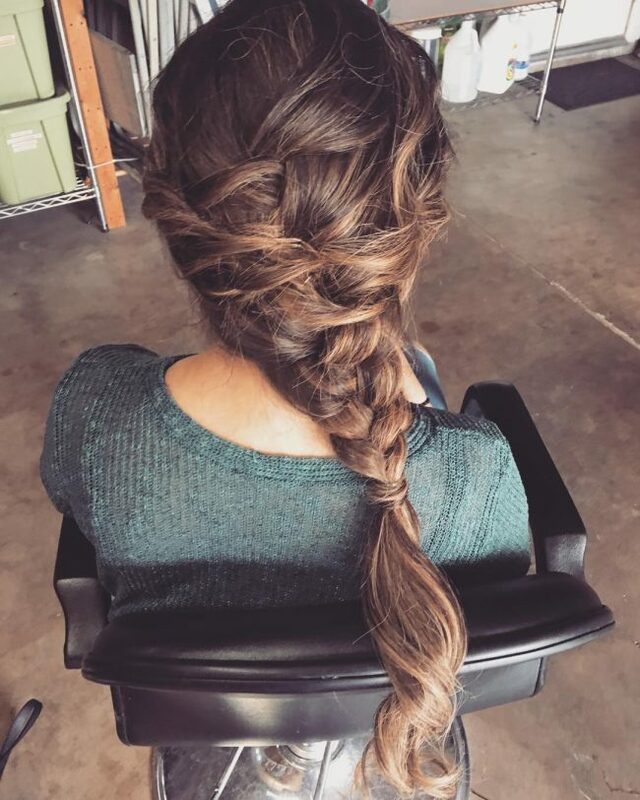 In this picture, the models' hair has been Dutch braided to the side and then woven into a three strand braid that continues over the shoulder. We can see how the upper hair has been teased and loosened while the end of the braid is firm and thin. This expertly colored and styled hair is an absolute masterpiece – sure to turn heads wherever it’s seen. 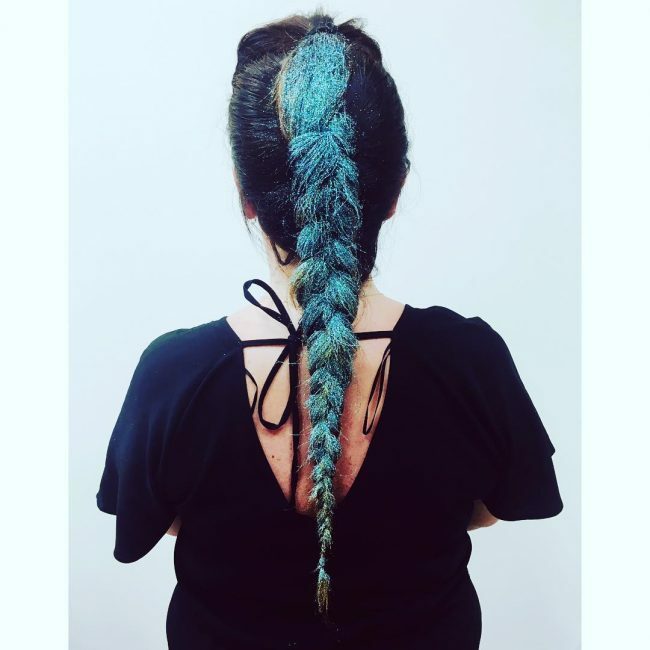 The base hair color is midnight black while the length of the braid (in the Dutch and the three-stand method) is an island sea blue decorated with a generous amount of glitter to add to the fantasy feel. In this picture, a thick Dutch plait has been woven to cross over the head and to the side before becoming a regular plait until the end. 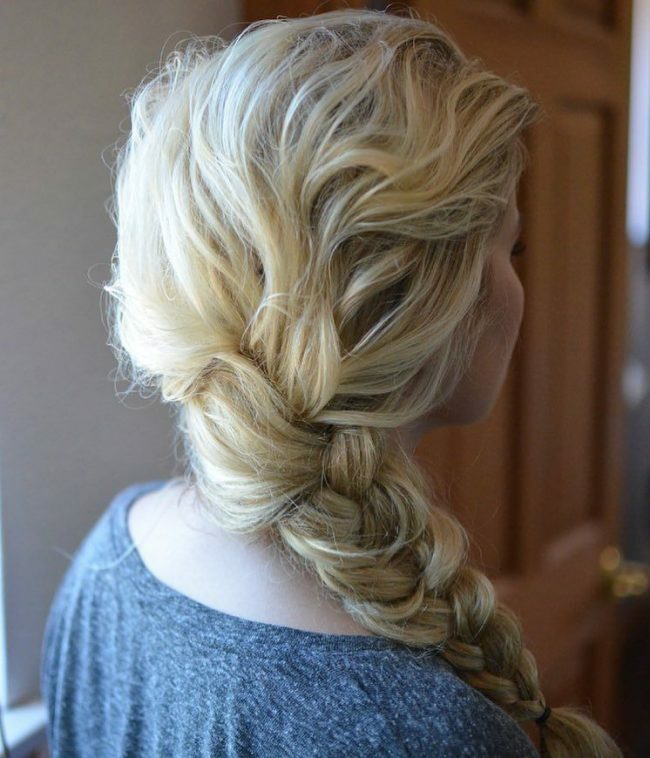 Sweeping the hair to the side like this is a less common way to do the Elsa braid but just as pretty! At the top of this hairstyle, the locks have been gently teased and sectioned to create a thick pull through combination braid. 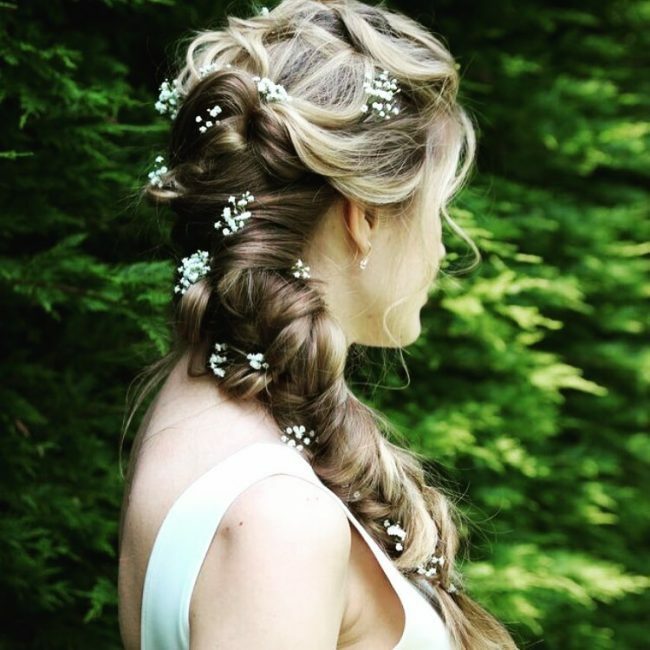 This technique has formed a full looking braid with lots of volume in the upper locks which have been decorated with white bridal flowers. 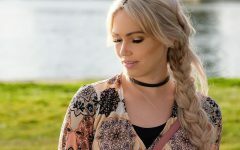 This hair may seem impossibly thick to you, but this fullness can be replicated by loosening your plait and ensuring that you tease the roots before you make the plait. You can also use hair extensions to bulk up the style. 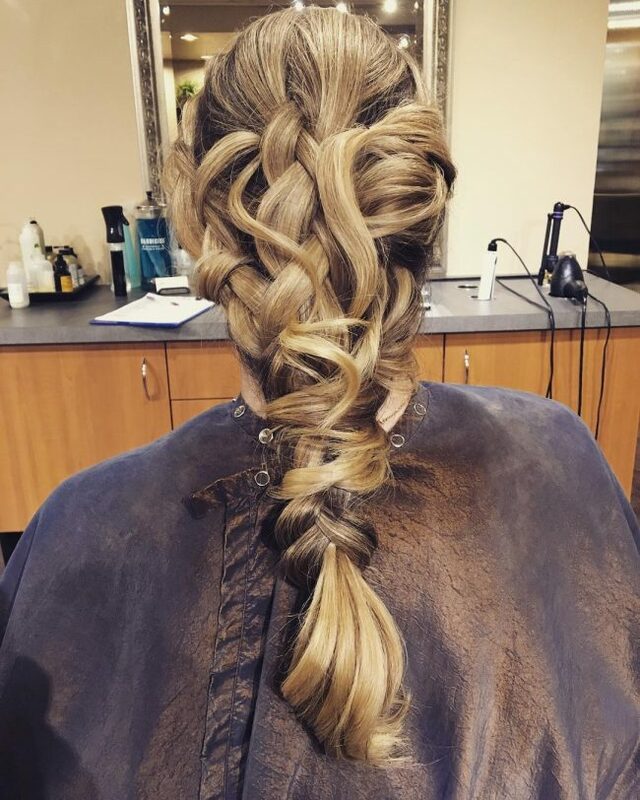 The stylist used the Dutch method for this hairdo and braided to the side and then over the shoulder. In this picture, the models hair has two French braids on either side that join together at the neck. From there the stylist switched to a tight fishtail braid which is secured in two places with hair elastics to thin it out. 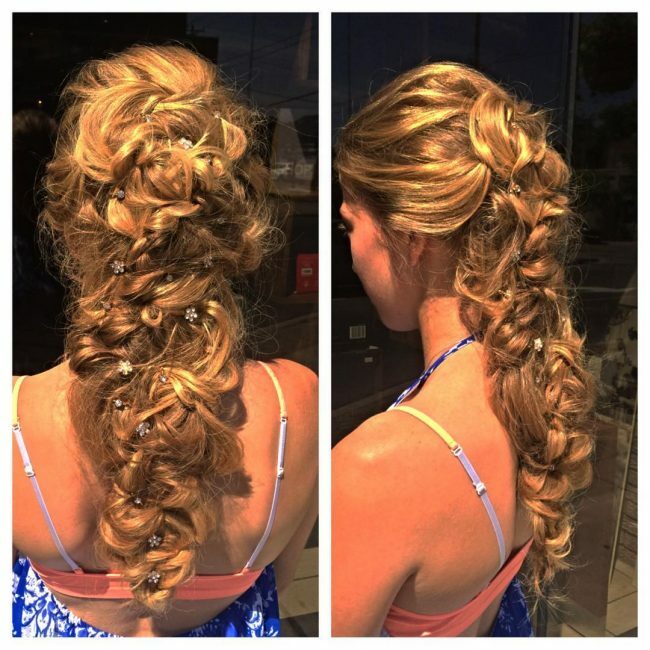 In this look, the hair has been brushed to one side and Dutch braided to cascade over the side and down the shoulder. The stylist did a great job of perfectly loosening the braid towards the end before tightly securing it so it tapers off sharply. 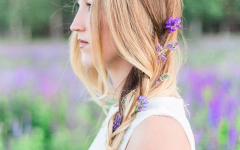 Elsa braid is the perfect look for summer – it can be worn every day and will keep your long locks out of the way. 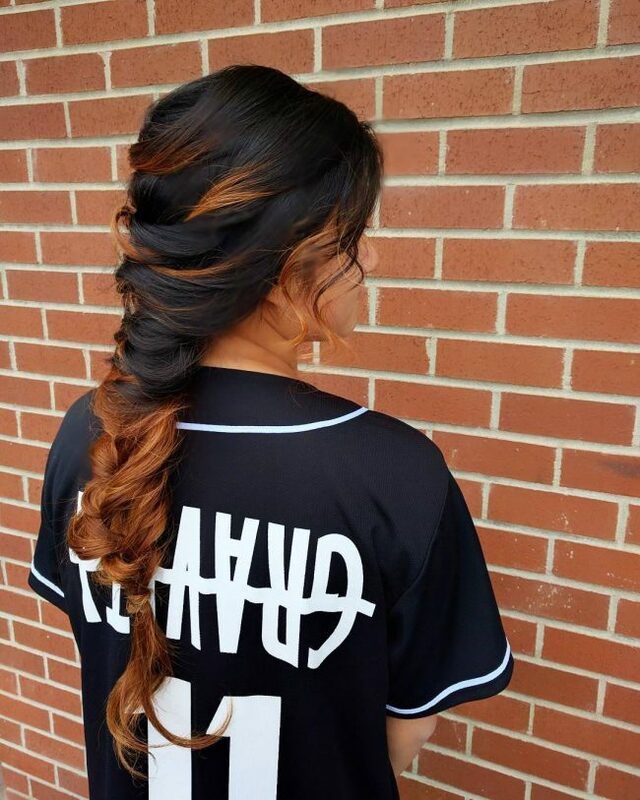 Remember the trademarks of this look include a loose and thick feel on top which tapers to a thin point in a braid that comes over the shoulder but you can add your own variations to make it unique. 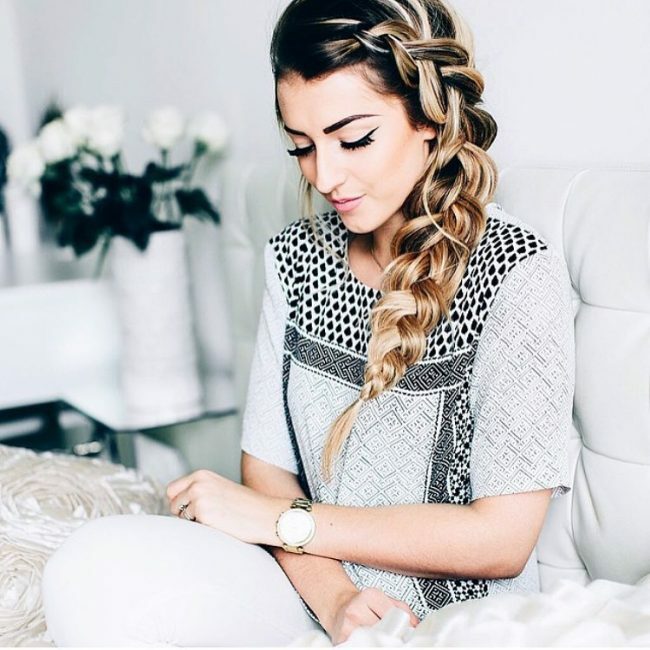 The Elsa style is a must-try look for all ladies with long hair!